The first thing when travelling from Romania to Ukraine and return is that you have to consider where is your destination in Ukraine and/or Romania. If you’re going to/from Western Ukraine (let’s say Lviv) or Central Ukraine (Kyiv)it’s clear from Bucharest of around you’ll cross Siret–Porubne border just North of Suceava South of Chernivtsi on Ukrainian side. From Transylvania is much easier and faster going through Sighetu Marmatiei – Solotvino in Marmarues region or Halmeu – Dyakove in North-Western Romania if heading to Western Ukraine. However if you’re heading to/from Southern Ukraine (Odessa or Crimea) then you’ll have to cross also Moldavia on your way or take this small country over which triples the way. The busiest and main border point connecting Romania and Ukraine is Siret-Porubne just North of Suceava on Romanian side and South of Chernivtsi on Ukrainian side. 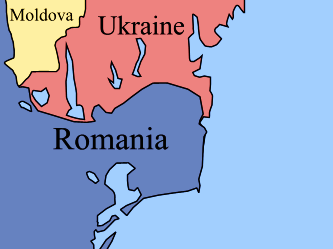 This border is used by private cars, buses and trains being the most comfortable connection for going from Romania to Ukraine and return. Main traffic flow to/from Bucharest goes here as well. From Bucharest North railway station you can get to Lviv or Kyiv directly with Sofia-Moscow train. It departs at 06:54 stopping in Suceava at 13:34. You can also get on train here if you’re heading from other places in Romania. Train departs from Suceava at 13:52 arriving to Chernivtsi at 18:32 from where you can basically get everywhere in Ukraine, not just Lviv and Kyiv. From Chernivtsi the same train continues going to Lviv (arr. 23:42) and Kyiv (arr. 09:31). Moscow-Sofia train departs from Kyiv at 20:12 and from Lviv at 05:40 arriving to Chernivtsi at 10:15. Then it departs from Chernivtsi at 10:40 arriving to Suceava at15:38 and to Bucharest at 22:50. Approximate costs are: Lviv-Suceava 35 EUR, Lviv-Bucharest 58 EUR, Kyiv-Suceva 50 EUR, Kyiv-Bucharest 65 EUR. is great alternative for long and expensive border train ride. There is one day daily official bus departing form Chernivtsi at 07:10 and arriving to Suceava at around 10:00. It costs’s 65 UAH (6 EUR). From Suceava the same bus departs at 13:00. But don’t worry if you missed this because there are more private buses operating between two cities. Just look for them at the bus stations of both cities. Most likely driver fill find you even faster. Use this option above in order to reduce your costs once travelling from Romania to Ukraine and not paying expensive international train fees but simply take domestic trains once you get to Suceava or Chernivtsi. Also you can take 1 hour flight with CarpatAir to Lviv or Chernivtsi from Timisoara for about 70 EUR which is also not a bad deal comparing to long and expensive train ride. On Romanian side very convenient border is Sighetu Marmatiei town 60 km north of Baia Mare. You can get there by long train ride from Bucharest and Central Romania or a short bus hop from Baia Mare. Crossing the bridge over the Tisa brings you to Ukrainian town of Solotvino from where you can take a direct daily train to Lviv. Train to Lviv departs at 17:25 and arrives at 06:40. It also stops in Uzhgorod along the way at 23:37. From Lviv to Solotvyno the same train departs at 20:23 stopping in Uzgorod at 02:32 and arriving to Solotvyno at 09:20. The cost is 77 UAH (7 EUR) – cupe and 52 UAH (5 EUR) – platzkart to/from Lviv and even cheaper to Uzhgorod. If you miss Solotvino-Lviv train consider taking 50 km bus drive East to Rakhiv where the train to Lviv leaves at 00:54 arriving at 09:13. This train also stops in Yaremche and Ivano-Frankivsk. From Lviv train to Rakhiv departs at 15:20 arriving at 23:48 and is rather not a good option for heading to Romania unless you don’t wanna stay in this highest elevated mountain town in Ukraine for a night. Another nearby border crossing point is Halmeu-Dyakove 30 km Norht of Satu Mare which is only permitted to cross by private car and long lines are common there.